AMD has launched a new professional graphics card designed for 4K workstations accelerated by the Open Computing Language (Open CL). The AMD FirePro W9100 is the industry's first GPU to pack in 16GB of GDDR5 memory, which allows multi-tasking over six different 4K displays. It features a 512-bit memory interface and 320GB/s of memory bandwidth. The card has a peak double-precision compute performance of a whopping 2.62 TFLOPS, and this number increases to a staggering 5.24 TFLOPS for peak single-precision. There are six Mini DisplayPort 1.2 connections, and a single card can power six 4K displays simultaneously. If that was not enough, up to four FirePro W9100 graphics cards can be combined in a single desktop workstation for even more graphics processing power and more 4K displays. The GPU also comes with full OpenCL 2.0 support to combine the graphics power of the FirePro W9100 with modern mutli-core CPUs. "Now is the time when 4K displays are more readily available and accessible," said Matt Skynner, corporate VP and GM of AMD Graphics. "We're seeing even more applications demand increased memory support while pushing the limits of real-time 4K video production and rendering." 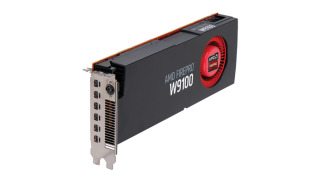 The AMD FirePro W9100 launches this spring.